Building on its racing heritage, TVS has launched a new generation of the Apache RTR 200 4V. The new motorcycle gets the advanced Anti-Reverse Torque (A-RT) Slipper Clutch. It also gets new race-inspired graphics and a fly-screen for better aerodynamic performance. 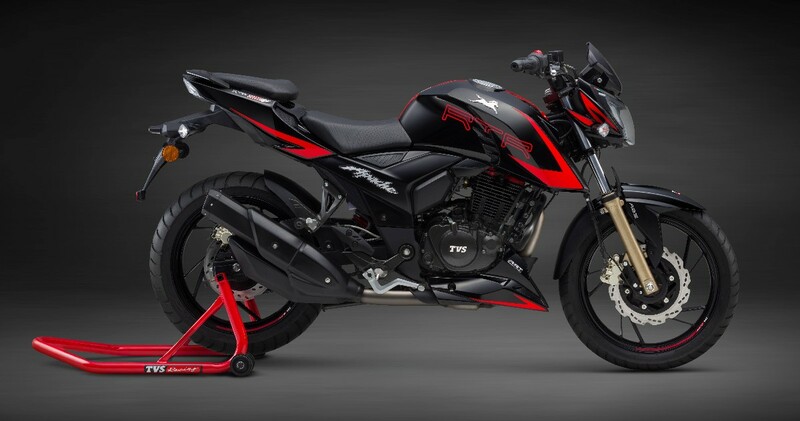 This new edition of RTR 200 4V has been labelled – Race Edition 2.0. Pricing for the bike starts at Rs 95185/-. The A-RT Slipper Clutch technology ensures 22% reduction in clutch force. This results in quicker up-shifts and better lap times. This technology is an advancement from a safety point of view during high speed downshifts. It’ll also help the rider to avoid wheel hopping while cornering and improve the motorcycle’s stability with the back-balance torque limiter effect. This promises more precise and sharper gear shifts with minimal effort. The engine of the new RTR 200 4V remains the same though. The motorcycle continues to be powered by a 197.75cc single-cylinder motor which is mated to a 5-speed gearbox. The engine develops 20.5 PS (Carb) / 21.0 PS (EFI) of power at 8500 RPM and 18.1 Nm of torque at 7000 RPM. The Apache RTR 200 4V Race Edition 2.0 is Priced at Rs. 95185 (Carburetor), Rs. 107885 (EFI) and Rs. 108985 (Carburetor with ABS), (Ex-showroom Delhi), the series will be available across the country*. (*EFI and ABS variants will be available only at select dealerships). chidafn, tanishq, WindPacer and 1 others like this. The complete package. First in class features, best in class quality. I think this is a no brainer now. Although TVS should first concentrate more on faster production with customers just spitting everywhere on internet about the delay in delivery(RR 310). The color and features really looks cool. But fly-screen does it really help on Aerodynamics or just plastic like in FZ-S.
TVS should focus more on fulfilling the demands. Though FI and ABS variant are launched still had not make their way to showrooms. Dealers are clueless about when these variants will reach showroom. Wow so much of difference that fly screen is making, nice! Difference in looks but it's not gonna make a huge difference on highways. Pretty sure you missed the sarcasm in my post. Bike looks amazing though. Matches my theme perfectly! Guys, any idea where in Bangalore both EFI and ABS version available? I checked with TVS showroom in Banneraghatta Road, they are not aware of anything about this launch itself. Same with the showrooms in Trivandrum also. All times are GMT +6.5. The time now is 10:35 AM.